WATCH: James Corden Has The Sweetest Story About The Time Gene Wilder Turned Him Down! The Late Late Show host remembered Gene Wilder in a unique way by sharing a memory of the late actor. Recently we lost another legend in 2016, the late great comedy genius Gene Wilder who is perhaps most fondly known for his performance as Willy Wonka in the 1971 hit film. But James Corden remembers him fondly from a personal encounter with the star which came to happen after Wilder went to watch him perform in a Broadway play. 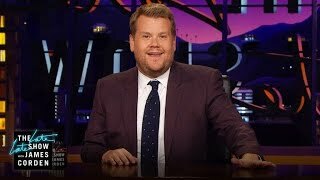 In the most recent episode of his Late Late Show, he paid tribute to Wilder and told the full story of a wonderfully Wonka-esque turn down by the star when Corden asked him to appear on the show. I don’t do or go where you were hoping, but I’ll be looking for you.